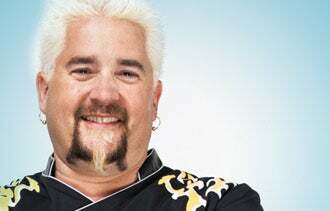 Before he took the Food Network by storm with his spiky, blonde hair, big personality, and the show Diners, Drive-ins, and Dives, Guy Fieri and friend, Steve Gruber, enjoyed success with Johnny Garlic's, a pair of California-style restaurants. Then, one night in 2001, the original Santa Rosa location caught fire. After they launched a second successful restaurant, Tex Wasabi's, in 2003, they focused on reopening the original Johnny Garlic location under a new name: Russell Ramsay’s Chop House, which opened its doors in spring 2004. The Chop House’s business lagged from Day One, never reaching the brisk business that Johnny Garlic’s had enjoyed. Fieri and Gruber even began adding Johnny Garlic’s dishes to the menu to try to attract former patrons, but nothing seemed to work. Then one day, Fieri was sitting at a traffic light, when a guy in the car next to him called over and asked, "Hey, why didn’t you reopen Johnny Garlic’s?" Fieri replied, "I did. It’s the Chop House." His former customer said he couldn’t afford to eat at the Chop House, and he missed the original restaurant. That was Fieri’s light-bulb moment. Customers wanted the familiar place they had grown to love. The Chop House gave off a too-rich-for-our-blood vibe—not a good fit for the eatery’s largely blue-collar following. Within a year, the Chop House closed and reopened Johnny Garlic’s, business was up 25 percent within the first month. As Fieri looks back on that experience, he says a few key principles enabled him to move past his setback and bounce back stronger than ever. 1. Listen to feedback from your customers. If Fieri hadn't paid attention to the guy who spoke to him at the red light, he might have continued trying to get customers to accept something they just didn’t want. 2. Understand your customers' perception of your business. The Chop House menu wasn’t significantly more expensive than Johnny Garlic's, but people thought it was. That's what mattered -- and what kept them away. 3. Check your ego at the door. Fieri could easily have let his track record as a successful restaurateur go to his head instead of admitting that the Chop House wasn’t the best fit. Really listen when you get feedback from customers and employees, he says. They’re telling you how you can be better. 4. Don’t give up on your dream. Find a way to make your dream work, even if you have to keep experimenting with new ideas and approaches until something sticks. "Surround yourself with good people who are dedicated and have good ideas, and can help you see what you’re missing. Don’t throw the baby out with the bath water [when times get tough]," he says.